There are few services I use more on a daily basis than Instapaper. The super-simple bookmarking tool has been my go-to way to come back to articles to read later for a few years now. And with brilliant iPhone and iPad apps, Instapaper has only gotten better with time. So I was happy to hear that developer Marco Arment was stepping down from his role as CTO of Tumblr to focus on the product more. And now he’s wasting little time trying to come up with some ways to make money and extend his creation. 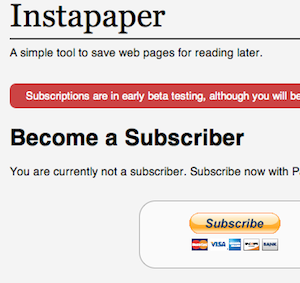 Today, Instapaper rolled out an early beta test of a new Subscriptions service. What is it? It’s a way to pay a subscription fee of $1 a month to the service. Actually, it’s technically $3 for 3 months, because PayPal takes a minimum of $0.30 for each transaction, so Arment needed to make the payment scale make sense financially. Subscribers are given the option to hide Instapaper’s advertisements. This option appears in Account. Some future features may be Subscriber-only, but please don’t buy a Subscription solely because you expect these exclusive features to be mind-blowing. They might be, depending on how easily your mind is blown, but I’d feel better if you bought the Subscription because you wanted to support Instapaper. To me, the idea of supporting Instapaper to ensure that it can continue to grow is enough to entice me to pay. For others, perhaps some newer features down the line will. Arment clearly is doing okay from app and ad sales, as he told us last month that the service has actually be profitable every month for the last two years. That’s most than most startups can say, but there’s obviously also a big difference between doing okay and making a solid living. If there were a few advanced features, I’d gladly pay upwards of $5 a month for Instapaper. One thing I’d love is the ability to make short notations about articles and, of course, search. I have no doubt Arment is thinking about those things, but he also likely wants to maintain the elegant simplicity of Instapaper, and avoid bloat.